Bottom Line: Nice, fenced, shady park with play options for big and little kids. A great place to practice bike riding. 4/5 stars. Worth Noting: there are bathrooms in the building, but it's not always open, esp. on weekends. Adjacent to a dog park, although the entrance to the dog park is away from the playground. This is another overdue post — I took these photos back in October. Now that the weather has warmed up, I’ve gotten motivated to get my playground postings updated. 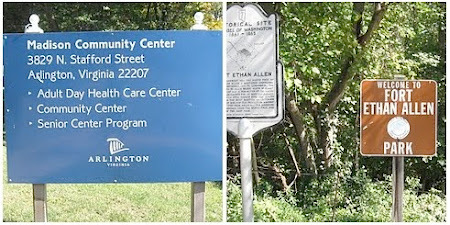 The name of this park is confusing — we (our family) refer to it as Madison Center, because it sits next to the community center which anchors this property. However, I think the surrounding grounds are known as Fort Ethan Allan park, which apparently are home to remains of ye olde fort. I’m not sure which domain the playground falls under, but it is a nice destination, especially if you have a mixed age crowd, like my kiddos. The playground is nestled on the backside of the community center and not visible from the road. To access it, park in the main parking lot, then follow the driveway around to the back of the building. If you are handicapped or have bikes/ride-on toys, you can drive up the driveway and park or drop-off toys. At the end of the driveway, you’ll see a basketball court right next to the playground. It’s perfect for riding. If the court is in use, there’s another paved surface inside the park fence. The playground is fully fenced, which is nice for those with runners. It has two main sections, one with equipment geared towards younger kids, and another for older kids. The toddler side features a smaller play structure with two small slides. The surface in this area is “dirty sand” and there are plenty of donated digging toys. There’s a swing set on this side with two baby swings and a couple of bouncer toys. There is also a water fountain near the gate that leads to the dog park access. The play structure and the swings can get sunny, but there’s plenty of shade to dig and bounce in. There are also picnic tables in the shade next to this area. The other section of the park is geared towards the 5-12 crowd. It has a bigger play structure with higher slides, a fireman’s pole, a spinny pole, really high monkey bars, and zip slide thingee. It also has a cargo net bridge thing (forgive my not so technical terms). The playground surface in this area is mulch. There are also two regular swings. Even though there’s a lot to do here, the footprint is pretty small so it’s not hard to keep up with multiple kids. There is also a grassy field next to the basketball court if you have kids that like to run and play ball. Madison/Fort Ethan Allen is a great park destination and usually not very crowded.